By Shikoku88Henro on 04/16/06 • Leave a comment! We have all seen it. Well, one Tom Myers has taken it to the next level with his real life working Blender Phone. The man figured: why not be able to blend a tasty smoothie and take calls at the same time? 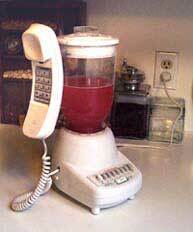 The result is an actual working phone and a working blender, joined at the hip. The ringer is actually the blender motor on pulse, so incoming calls have never sounded so angry. To make and receive calls, you pick the whole pitcher up, with phone attached. The blender is fully functional, so it’s not like this is a device that will just waste space on the countertop. He is selling them for $300 each on his site, sometimes having them in stock while usually making to order. I can’t wait to put people on hold in order to kick back a homemade Hurricane.